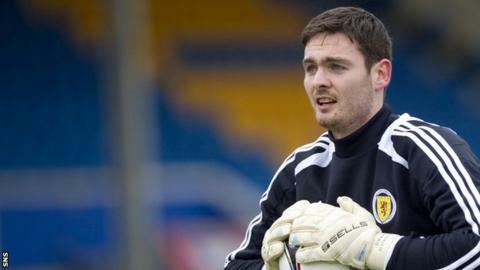 Scotland goalkeeper Craig Gordon fears persistent injury problems could threaten his playing career. Gordon, who has been plagued by injury, has joined the coaching staff at Scottish First Division club Dumbarton. "It's very unlikely I will be playing again this season," he told the club's website. "In fact, I'm not sure if I'll play again, so I'm looking to get into coaching as I want to remain in the game." Gordon, 30, began his career at Hearts before moving to Sunderland for £9m in 2007 to make him the most expensive goalkeeper in British football. However, a knee injury midway through his second season with the Black Cats left him sidelined for several months. He also suffered a broken arm and was released by Sunderland in May last year. "I'm not ruling out playing again, but I need to get things in place if the news is not good in that respect," he said. Gordon, who has 40 caps for Scotland, revealed that he explored the idea of coaching when he met Dumbarton boss Ian Murray. "We agreed last week for me to come in and start things at Livingston and it may become a regular thing. "I enjoyed the game and viewing it from a coaches point of view was fascinating."